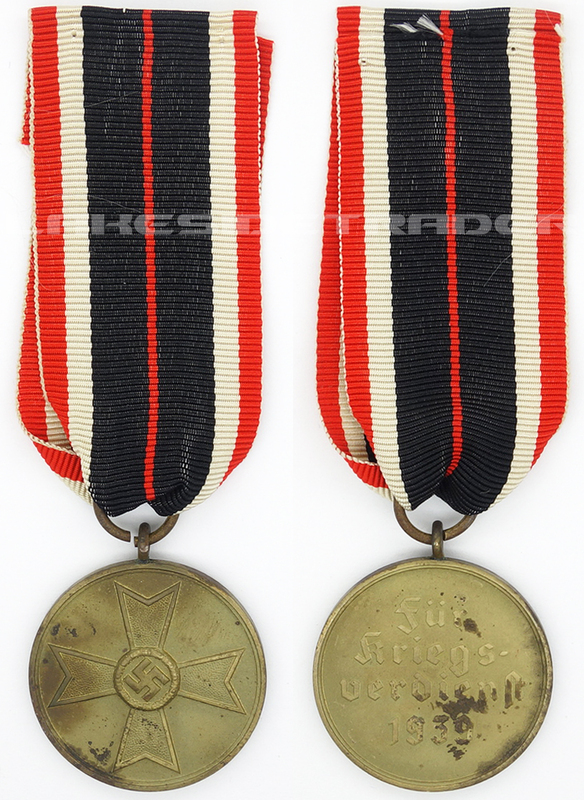 Here we have a Kriegsverdienstmedaille 1939 that was awarded to recognize outstanding service by civilians in connection with the war effort (primarily those working in war factories). It is constructed out of a die struck tombak base that has been bronze washed. The round shaped obverse features an embossed 1st class war merit cross without swords on a smooth background with a thin embossed outer border. The reverse reads: “Für Kriegs-Verdienst 1939” (For Outstanding Services in War 1939) on a smooth background with a thin embossed border. To the top is a soldered loop and ring which holds approximately 5 inches of the correct red, white and black ribbed rayon ribbon. It measures approximately 1 1/4 inches in diameter. A nice example!